New York in 1845 was a powder-keg of unrest. With an influx of Irish immigrants escaping the tragic Great Potato Famine into an already packed city, the New York summer of 1845 was filled with riots, religious unrest, murder, and the eventual birth of the New York Police Department, known by New Yorkers as a "standing army." Timothy Wilde, once a bartender with an unfulfilled love for a charitable woman named Mercy Underhill, has accepted a position as a policeman after a horrible fire leaves him with no bar to tend and his face disfigured. Amidst racism, brothels, drugs and murder, Timothy learns there is much more darkness in the city than he ever imagined. When a young girl, Bird, runs into him one night during his rounds, her nightdress covered in blood, with unbelievable stories of a murdered child, his new career becomes even darker. A strong dislike for his older and more politically-minded brother, Val, Timothy's got an ethical side that can't be undone. Even with Bird, he doesn't have the heart to deliver her to the House of Refuge for orphaned children and instead takes her back to his apartment building where the female proprietor cares for her. As he takes the case to uncover the child murders, which seem to point heavily to a blatant hatred for Irish Catholicism, Timothy's unsure of who to rely on. His brother is of questionable character and the locals don't take any issue with brothels, even if children are an option. It's a gritty underworld that he didn't expect to be immersed in. The Gods of Gotham is superb with early 1800s elements of New York life and American history, from the combination of race and religious unrest to the Irish "assimilation" into New York and even to the seedy brothels. While Mercy Underhill maintains her own sense of willful independence that at times was shocking, she provides the clear contrast to the city's evil with her ministering of care to the orphans and uncared for children, all the while dreaming of her one-day voyage across the Atlantic to England to escape New York. Each piece of the story was brilliant. The story and historical elements are fascinating and while it was a bit wordy at the start of the book, it evened out and became an engaging tale which makes me now eagerly await the sequel. At that time, though, I will be reading the printed version versus listening to the audio. 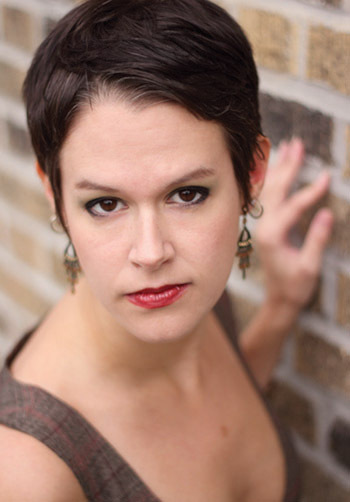 Lyndsay Faye is the author of Dust and Shadows: An Account of the Ripper Killings by Dr. John H. Watson and the most recent bestseller The Gods of Gotham. Originally from the Pacific Northwest, she has adopted New York City as her second home, where she resides with her husband and too many cats and is at work on her next novel, a sequel to The Gods of Gotham. Audio Notes: Steven Boyer is an established narrator and has an extensive portfolio available on Audible.com. For a sample of his work on The Gods of Gotham, click here. This is my first selection for Carl's RIP VII event at Stainless Steel Droppings. Participants' reviews can be found here. I loved this book, but totally agree with you with the disappointment with the narration. I actually like Steven Boyer as a narrator, but thought he was totally wrong for a period piece like this. His first person narration came off too polished for such a gritty tale, and I struggled with the audio at first until the story really pulled me in. I think that so many people liked his reading, because it was "listenable" but for me, I'd rather have authenticity in a narration over a pleasant voice. I haven't listened to Steven Boyer before and I'm glad you posted your comment because I would have probably shied away from selecting another audio if he was the narrator. I can see him being perfect for other, perhaps more contemporary works, so I'll definitely check out the other options! I do so wish there was more of an accented flavor to it, and you're right, it came off much too polished for such a dark tale! I read this in print and the flash jargon drove me to distraction. I was one of the few people who didn't love the book. This book sounds like it has a great atmosphere and sense of time & place. It's a shame the narration didn't work out for you. It did have a perfect feel for the atmosphere; I'm definitely looking forward to the sequel! I am so with you on the importance of good narration! I can go crazy over mispronounced words, too, especially place names. ....and emphasis in the wrong places, and all sorts of bizarre narrator things! Yes, incorrect pronunciation, misplaced intonations, it can create a very different world than the intent! Drives me nuts! Well pooh. I actually just commented on another blog today that maybe because of the jargon, the audio would be the better choice of media. I've found that jargon is easier to handle when you hear it. Plus, Irish accents! Perfect for narration. Totally a missed opportunity here. You know, I think Sean West who narrated Maggie Stiefvater's The Scorpio Races may have been an excellent choice for this book. Not sure, but I would have voted for him to narrate this one any day! Definitely one book I want to read -- glad you seemed to enjoy it. The story was wonderful, I'm looking forward to the sequel! Natalie you nailed this review - especially with regard to the audio version! I also listened to the gods of gotham and found the "flash" slang to be so very interesting....the rest of the audio version was definitely flat ~ so flat it kept putting me to sleep. I finally had to get the actual print version to finish this one and that rarely happens, if ever. Thanks for such an eloquent and specific review - I never could put the words to what I thought so I'm glad to have read your review! You must have been inside my head! I read this book and I LOVED it! But I have had probs in the past with certain audio versions of books. Many loved the audio version of 11/22/63 ... I hated it. I was so annoyed with the narration that I had to read the last half of the book to finish it. That's the first I've heard that 11/22/63 was a tough one to listen to, I kept hearing that it was awesome! Glad you ended up finishing it by reading it, that's how I experienced that story and I loved it. 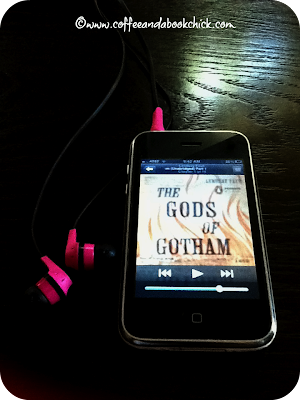 I'm looking forward to the sequel for The Gods of Gotham, but I'll be picking up the print version of it next time! I am glad that I went with the print version of this one, because the bad narration would have made me just shut it off and I would have missed a great story. It was one of the better books I read this past year, and I am so glad that you enjoyed it too! The author had a way of keeping everything really tight and suspenseful. Great review today! I really enjoyed the story, but it was hard for me to look past the narration of it, unfortunately, and I feel horrible sharing that since the narrator is clearly an established voice for several outstanding books. This just wasn't a good match for me in my very selective listening preferences, but it definitely was a hit for other audio reviewers! Natalie -- are you aware you are a "no reply blogger". I was too and didn't realize it until Trish told me. I can never respond to your comments by email -:( You can go to blog settings / comments and change that if you wish. Diane, can you check and let me know if it's working now? I wasn't sure what that meant as a "no reply" so I just Googled it and I *think* I have it fixed now. I'll comment on your site so we can test it out, thanks! Interesting! I've been waiting for the audiobook at the library for the longest time because this seemed like the perfect book to listen to rather than read. I may just change that request now! Definitely take a look at the other reviews on the Audible.com site; I'm in the minority with my feelings on it, so you might really enjoy the narration. Let me know what you think if you do end up listening to it! Natalie, first, I ADORE how you posted the book cover on the IPOD. That looks cool and in brilliant! I have yet to read this one but have t in the TBR. I've been hearing so many good things about this book! For some reason, the title turns me off, but considering the rave reviews, I hope to see it soon. I would definitely suggest reading the printed version versus listening to it, although I am in the minority with my listening experience. I do plan to pick up the sequel to it when it is released! I'm sorry the narration wasn't what you wish it would be. You are a much better listener than I am. I'm not sure I've ever persisted with an audio book if I didn't like the narration. That is generally when I turn it off and go find the book. The story sounds intriguing though and so I'm glad you stuck with it. I read several reviews of this book when it first appeared on book blogs. Although initially interested, the last few reviews I read considerably dampened my interest. Silly me. Your review reminded me why I was originallyexcited about this book. I'm sorry the audio version didn't somewhat ruined a positive reading experience for you. I'm still a devoted paper-page-turner(! )so I wasn't muc bothered by the flat, boring narrator except to be disappointed for you. I am looking forward to reading about the creation of the NYPD and NYC in the mid-1800s along with some intriguing characters. I thoroughly enjoyed your review and can't thank you enough for restoring my interest in this book and reminding me to think more clearly when reading reviews! I was happy to read this review. I have struggled, struggled, struggled with this horrible narration of an interesting story. As an "audible-phile", I think some books would have been better if I had read myself, and this is at the top of the list. Flat, monotone and almost whiny, Boyer (a perfectly fine narrator) did not have the voice/accent to fit with the time period at all. If I hear "copper star" in that voice again, I will scream. What a waste! Anyway, glad to sound off with someone sho agrees. Some that the narration made huge impacts: The Goldfinch, Bloody Jack (YA series), The White Woman on the Green Bicycle, Flavia de Luce series, Gone Girl, Freedom (J. Franzen) and the Three Pines mysteries (L. Penny).